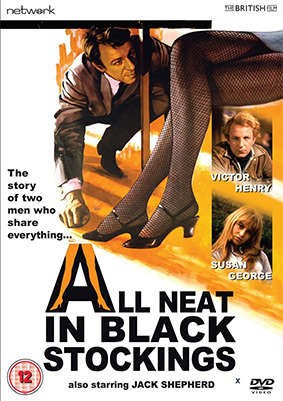 The sort of title that probably had them running to the cinema (when no-one else was looking) back in 1969, All Neat in Black Stockings features then rising star Victor Henry (Privilege, The Sorcerers) as Ginger, the great Jack Shepherd (Wycliffe, Charlotte Gray) as Dwyer and none other than Susan George (Straw Dogs, Up the Junction) as Jill. The film's bold intermingling of sexual adventure, humour and tender love story instantly caught audience’s imaginations, its evocation of London’s dingy back-street pubs and dubious characters marking it out as a potential cult favourite. All Neat in Black Stockings will be released on UK DVD on 27th January 2013 by Network Distributing as part of "The British Film" collection at the RRP of £9.99. The film is presented here in a brand-new transfer from the original elements in its as-exhibited theatrical aspect ratio.